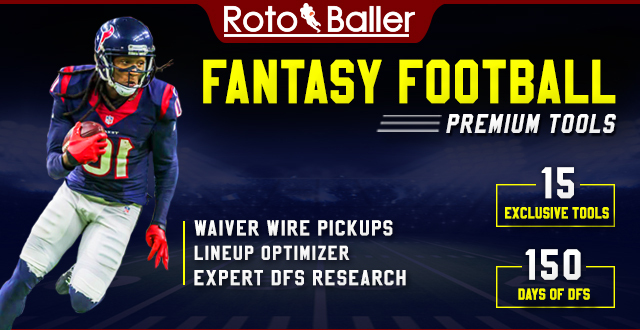 Welcome, one and all, to the weekly piece that puts my rankings under the microscope and gives me a chance to explain myself against the Expert Consensus Rankings (ECR) found on FantasyPros. If this is your first time reading me, then hi! Why should you care about me? Well, my finish as the ninth-most accurate in-season expert on FantasyPros out of ~125 smart cookies last season should suffice. I’m out here trying to hang with the Sean Koerners and Jake Cielys of the world, and you’ll have a front-row ticket to my efforts every week. At the bottom of this article you'll find my personal rankings, the Expert Consensus Rankings (ECR) for the industry, and how they compare. If anything strikes a chord, I’m always available for questions via Twitter: @NMariano53. But enough chit-chat, let’s dance. I can see right away that I like Andrew Luck and Tyrod Taylor three slots above the ECR, with Taylor rising into QB1 territory thanks to his mobility. The Browns should be out to send a message to the league and a vulnerable division rival that they’re a real football team again, with Tyrod’s athleticism helping weaponize Josh Gordon, Jarvis Landry, David Njoku, and Duke Johnson. As for Luck, he gets to play in his precious dome with an exciting new head coach, Frank Reich, at the controls. I think Jack Doyle and Eric Ebron will be forces against a Bengals team without Vontaze Burfict, and Ryan Grant is going to earn your respect throughout the season. With Marlon Mack likely out for Week 1, Luck will probably need to do the heavy lifting. The Bad: Jimmy Garoppolo and Dak Prescott are both hard passes for me. Like, not even in QB20 territory for a two-QB league. Jimmy G is going up against one of the toughest defensive units in the game, the Vikings and Mike Zimmer, while Prescott’s athleticism will be his only hope on the road against Carolina. Prescott and the Cowboys will surely miss stud center Travis Frederick up the middle, but this is also about a passing game that needs to establish an identity without Dez Bryant and Jason Witten. James Conner’s rank could move by several slots by the time I’m done writing this. But I don’t think Bell’s reporting status affects Week 1 anymore, as that’s going to be Conner. I have him as my RB16 (ECR 23) and would happily flex him unless Bell signs on Saturday. Kenyan Drake and the Dolphins are set to face the Titans as one-point underdogs, which plays right into Drake’s hands. I doubt Frank Gore gets serious run unless Miami is in clock-killing mode, but a competitive game means Drake should be able to grind on the ground against Tennessee’s studly run defense (top-10 unit in both ‘16 and ‘17). That sounds bad right? Well, it is in a vacuum, but the Titans also habitually gave up chunks of receiving yards to opposing RBs, which is a strength of Drake’s. I’m trusting the volume and the game script to get him through a tough matchup as my No. 12 RB against the ECR of 16. I have Marshawn Lynch five slots above ECR (20 vs. 25) and Doug Martin 13 slots up (48 vs. 61), as I can’t see Jon Gruden getting away from the run often with the Rams’ insane secondary making life rough on Derek Carr. Perhaps they’ll use Jared Cook well and surprise me, but Oakland’s offensive line is their greatest strength here. Also, Austin Ekeler isn’t getting enough respect here. He's my No. 45 RB against an ECR of 54. I know Melvin Gordon is a workhorse but Ekeler can be an effective change-of-pace back with the receiving chops to be a top-50 RB on a weekly basis. I've seen reports floating that LAC may deploy him as they used to do with Danny Woodhead, and his teammate Mr. Gordon put up a 6-91-0 receiving line out of the backfield against KC in Week 15 last season. Ekeler's rookie season was cut short by a broken hand, but I think Year 2 brings some sneaky, flexy fun. I’m not absurdly low on anyone compared to the ECR toward the top, though I don’t have Royce Freeman in my top-20 (ECR: 19, My Rank: 23) because I can’t trust Vance Joseph to be intelligent. And I respect anyone who wants to play Dion Lewis in PPR, but him standing at 26 in standard feels a bit high to me (My Rank: 31). Until I see how Tennessee is deploying both he and Derrick Henry, I’m wary to trust him in a TD-dependent scoring setting. Deciphering which TEN RB is "the guy" will likely be maddening throughout 2018, but attacking a defensive front that lost Ndamukong Suh with Henry's power seems like the best move. I have both Kerryon Johnson (My Rank: 43, ECR: 37) and Sony Michel (My Rank: 54, ECR: 45) low, but not because I'm a rookie hater. Well, not just because I'm a rookie hater. I think Johnson will eventually win out in Detroit's backfield and Week 1 against the Jets could bring plenty of carries as Detroit are heavy home favorites, but LeGarrette Blount's presence at the goal line and Theo Riddick's passing-game prowess really limit the upside until proven otherwise. Michel may not be 100% yet and is part of a crowded backfield that will have to run against a scary-when-healthy Houston front. That's a rather easy pass for me to open the season. There aren’t any egregious gaps at the top, though I do like Robby Anderson, Kenny Stills and Keelan Cole roughly four spots more than the pack. These guys all have something in common: they’re the No. 1 WR on a subpar passing offense. Volume rules everything around me...VREAM? I’d be comfortable with Robby as a low-end WR2 this week in a dome game where the Jets should be trailing early and often, whereas Stills and Cole are solid WR3s. The first big gainer for me is Tyler Lockett, who could be Russell Wilson’s favorite target as a dinged-up Doug Baldwin does battle with Chris Harris Jr. in the slot. This whole offseason has seen the fantasy community dump on Seattle’s ground game and offensive line, which leaves Lockett and TE Nick Vannett as decent outlets. Then there’s Phillip Dorsett, who is my WR54 compared to the ECR’s WR67. I understand the trepidation with Dorsett, who has failed to leave a mark despite playing with Brady years ago and Andrew Luck, but the opportunity is here. The Patriots will use James White and Rex Burkhead like WRs to mask the absence of Julian Edelman, but Dorsett should still see a ton of snaps. I’d have him higher if more of those weren’t set to come against Johnathan Joseph, but HOU-NE is the only game with a Vegas total currently above 50 (51 as of Thurs. night), which turns any piece involved into a target. I’ve mentioned in passing how I’m a bit lower on guys like Baldwin and Crowder, so let’s also knock Sammy Watkins down from a WR3 (ECR: 36) to a lower WR4 (My Rank: 43). He’s set to be shadowed by lockdown CB Casey Hayward unless Andy Reid makes good on his coachspeak and works him into the slot. Either way, Watkins only caught one-of-seven targets out of 67 preseason snaps and could goose fantasy owners in Week 1 if he plays >50% of snaps opposite Hayward. Don’t chance this, folks, not with a rookie QB making his debut on the road. It should come as no surprise that I’ve got Jack Doyle as my No. 8 TE compared to the No. 11 ECR rank, what with my previous feelings about Luck. It remains to be seen whether Luck can truly take advantage of T.Y. Hilton’s speed with the deep ball, but we have seen that he can hit Doyle on short and intermediate throws. Then there’s old man Benjamin Watson, who is now reunited with Drew Brees after a three-year vacation. Watson quietly led the Ravens in receiving last season and still has plenty in the tank. Even if you think he won’t last all year, he’ll face a Bucs defense that juiced up it’s D-line but still has a subpar pass defense that finished 22nd in DVOA against TEs per FootballOutsiders. If you drafted Greg Olsen then you’re playing him in Week 1, but those of you in the DFS waters should ponder pivoting. I have him at No. 7 against an ECR of 4, due in large part to the sudden depth of Carolina’s pass-catchers and Cam Newton’s propensity to score TDs himself. Only two TEs secured at least five catches for over 50 yards against Dallas last season, and I think both Travis Kelce and Hunter Henry are more athletic than 2018 Greg Olsen. I know many are relying on an O.J. Howard breakout to occur and his ECR of 15 puts him around the TE1 conversation, but I’m ranking him 23rd against the Saints. On the one hand, we don’t know how the Bucs will utilize Howard and Cameron Brate, and on the other hand, the Saints are really freaking good against TEs. Gronk torched them for a 6-116-1 line in Week 2, but the next 14 games saw only Vernon Davis top 50 yards against NO in the regular season. Yes, Greg Olsen did eclipse 100 yards in the Wild Card Round but the Saints recovered to limit Kyle Rudolph to 28 yards in the Divisional Round. You get the point, only top TEs have stood a chance. Howard is not a top TE and the Bucs coaches aren’t exactly top schemers. I’d rather talk more about the skill positions than include kicker or defense, as they are far less interesting to me. Feel free to send me a vitriolic message should you want them back, I’ll listen I swear.